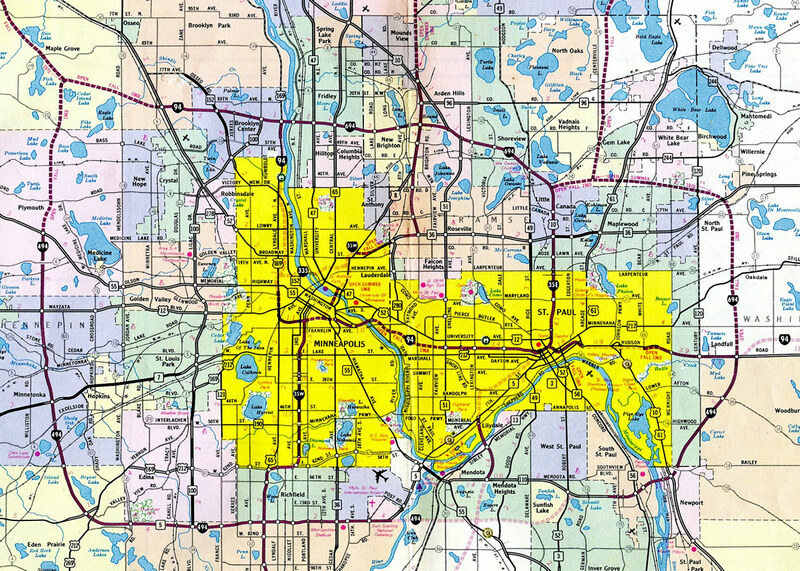 Interstates 494 and 694 constitute the 72 mile long Minneapolis-St. Paul beltway system: I-494 is the southern portion and I-694 is the northern portion. The westernmost eight miles of I-694 overlap with Interstate 94 between Maple Grove and Brooklyn Center so that both branch routes end at the same location on either side of the metropolitan area. The two belt routes share an exit numbering system, with numbers counting upward in a clockwise direction from the Minnesota River at Bloomington. Interstate 694 extends for 31 miles serving communities such as Brooklyn Park, Fridley, New Brighton, Shoreview, White Bear Lake and Maplewood. Providing a bypass for I-94 travelers from St. Cloud to Eau Claire, Wisconsin, I-694 also serves as a commuter freeway across the northern Minneapolis and St. Paul suburbs. This formerly included a short overlap with Interstate 35E at Vadnais Heights. 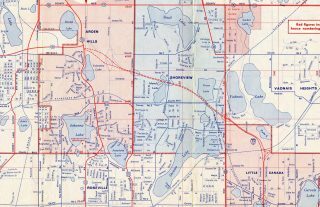 Like Interstate 494 to the south, Interstate 694 to the north of Minneapolis and St. Paul replaced portions of the original Twin Cities belt line route, Minnesota 100. Prior to the Interstate system, MN 100 comprises a 360-degree loop encircling the metropolitan area along a series of two and four lane surface roads. Sections of the route were directly incorporated into the Interstate system, including I-494 across Bloomington and the Wakota Bridge spanning the Mississippi River. The east-west section of I-694 between Brooklyn Center and then-U.S. 10 (CSAH 76) at Arden Hills also replaced MN 100 directly. A short segment of I-694 opened to traffic in tandem with I-35E north from Maryland Avenue in St. Paul to Rice Street (former MN 49 / Exit 45) at the Little Canada and Vadnais Heights city line. 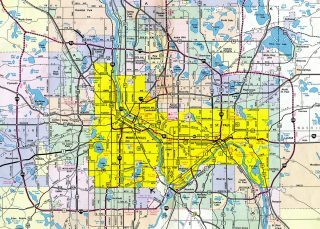 The 1961-completed section was extended west to Arden Hills and the old junction of U.S. 10 and Minnesota 100 the following year. Construction underway to extend I-694 west from Rice Street to U.S. 10 in 1962. U.S. 10 now travels along freeway overlaps with I-35E and I-694 from St. Paul northward to an expressway through Arden Hills. Origins of the newer alignment appeared in 1962 with the I-694 roadway separation and temporary ramps to Snelling Avenue. 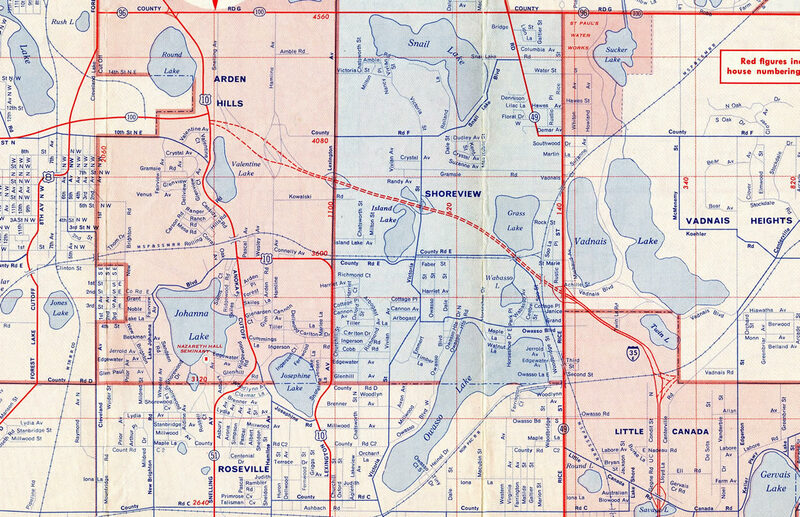 U.S. 10 was realigned onto I-694 from I-35E to Arden Hills by 1969. The split with I-94 at Brooklyn Center defaulted traffic onto U.S. 169 south into Minneapolis. The route north from I-94 is now Minnesota 252. Passing under the Stillwater Boulevard overpass, I-694 travels as a four-lane freeway to the exchange (Exits 58A/B) with Interstate 94 and U.S. 12. Photo taken 06/15/15. I-694 travels between several subdivisions to the 15th Street North overpass. Posted here is an interchange sequence sign 1.25 miles ahead of Interstate 94. The east-west freeway runs along the Oakdale and Woodbury city line. Photo taken 06/15/15. South from the CSAH 10 (Tenth Street North), I-694 advances 0.75 miles to the full cloverleaf interchange (Exits 58A/B) with Interstate 94. U.S. 12 follows I-94 west to I-394 and east to Hudson, Wisconsin. Typical for most Interstate/U.S. Highway overlaps in Minnesota, U.S. 12 is unsigned along the freeway. Photo taken 06/15/15. An end sign for Interstate 694 stands ahead of the 4th Street North overpass. Business parks line both sides of the freeway on this stretch. Photo taken 06/15/15. Interstate 694 south transitions to Interstate 494 south as Exit 58A departs for Interstate 94 (and U.S. 12) west to Downtown St. Paul. I-494 continues the belt line southwest to Woodbury, Newport and South St. Paul. Photo taken 06/15/15. Interstate 494 meets Tamarack Road (Exit 58C) at the third Woodbury exit northbound leading to Interstates 94 and 694. Note that Madison is used as the control point for I-94 east in place of Eau Claire. The capital of Wisconsin is a good 250+ mile drive east along Interstate 94, while Eau Claire is only about 80 miles away. Photo taken 06/14/15. Interstate 494 north expands to four lanes now as drivers see a sign for the I-494 end and I-694 beginning. Photo taken by Chris and Amber Lokken (01/08/07). Interstate 694 takes over for the ending I-494 as drivers part ways for Interstate 94 east to Hudson, Menomonie and Eau Claire, Wisconsin. Photo taken 06/14/15. Traveling west along the Lake Elmo and Woodbury city line, drivers along Interstate 94 & U.S. 12 pass under an interchange sequence sign posted 1.5 miles ahead of Interstates 494 south and 694 north. Photo taken 06/15/15. Traffic merges onto I-94 west from Inwood Street as the freeway progresses one mile west to the cloverleaf interchange (Exit 249) with the Twin Cities beltway. Photo taken 06/15/15. A fifth westbound lane accompanies I-94 & U.S. 12 west to the c/d roadway (Exit 249) for Interstates 494 and 694. I-694 constitutes the preferred bypass route for through traffic west to St. Cloud and other points west. Photo taken 04/23/07. Traffic separates from the I-94 mainline west to St. Paul for Exit 249 and the beltway north to White Bear Lake and south to Newport. Photo taken 06/15/15. Now on the collector distributor lanes, the first off-ramp leads to Interstate 694 north to Oakdale. The second ramp serves Interstate 494 south to Woodbury, then west to South St. Paul, Inver Grove Heights, Bloomington, Richfield, Edina and Eden Prairie. Photo taken 06/15/15. The cloverleaf interchange at Interstates 94-494-694 is one of several in the Twin Cities area still in use. Others are located at I-394 at I-494, I-35E and I-694 and I-494 at I-35W. Photo taken 004/21/07. Beyond the McKnight Road interchange, the first advance sign for the Interstates 494/694 interchange appears on I-94 east at Exit 247 for Minnesota 120 (Century Avenue) north. Interstate 94 leaves Ramsey County (city of Maplewood) and enters Washington County (city of Woodbury) here as well. Photo taken 04/21/07. A fourth eastbound lane accompanies I-94 & U.S. 12 east from the Century Avenue on-ramp to Exit 249 for Interstates 494 south and 694 north. Photo taken 04/21/07. Interstate 494 south passes through Woodbury to south Maplewood and Newport before crossing the Mississippi River to South St. Paul. Photo taken 04/21/07. Eastbound Interstate 94 and U.S. 12 reaches the collector distributor roadway (Exit 249) for Interstate 494 south and Interstate 694 north. Photo taken 04/21/07. Drivers loop away from the c/d roadway for Interstate 694 north back toward the north St. Paul suburbs of White Bear Lake, Vadnais Heights and Shoreview. Connections with Minnesota 36 also lead motorists east to Stillwater. Photo taken 04/23/07. An end sign for I-694 west appears along I-94 at the full cloverleaf interchange (Exits 29B/A) with U.S. 169. U.S. 169 comprises a major freeway leading north to Brooklyn Park and south to New Hope and Plymouth. Photo taken 06/14/15. An auxiliary lane joins Interstates 94 & 694 west from U.S. 169 to Exit 28 with CSAH 61 (Hemlock Lane). Three lanes continue otherwise to the three wye interchange (Exit 27) with Interstate 494 south. Photo taken 06/14/15. This interchange sequence sign references the first exit of Interstate 94 west beyond the Twin Cities belt line. I-94 remains somewhat suburban to Albertville. Photo taken 04/23/07. Exit 28 leaves I-94 & 694 west for Hemlock Lane and a busy retail corridor spreading to the northwest to Exit 215 of I-94. Forthcoming Interstate 494 leads south from Maple Grove as a busy commuter freeway to Plymouth. Photo taken 06/14/15. The left two lanes connect to Interstate 494 south to Plymouth, Minnetonka, and Eden Prairie while the mainline continues Interstate 94 and U.S. 52 northwest to St. Cloud and Fargo, North Dakota. Photo taken 06/14/15. Interstate 694 west ends as Interstate 494 south begins. This exchange marked the temporary end point of I-94 west from 1968 to 1973, when the freeway was completed to Albertville. Photo taken 06/14/15. Similar to signage found along I-94 & 694 west, an end sign for I-494 north precedes the junction between the three routes at Maple Grove. Photo taken 04/22/07. Posted just north of CSAH 10 (Bass Lake Road) was this overhead allocating lanes for the connection from Interstate 494 north to Interstate 94. I-94 & U.S. 52 west leave the Twin Cities metro area for St. Cloud and Fargo, North Dakota. This sign bridge was removed during 2014-16 reconstruction of I-494. Work here expands the freeway to seven overall lanes. Photos taken 04/22/07. Exit 27 departs from the left beyond the East Fish Lake Road overpass for Interstate 94 west. The beltline east becomes both I-94 & 694 east toward Brooklyn Center, Minneapolis and New Brighton. Photo taken 04/22/07. Interstate 494 north reaches Exit 27 for Interstate 94 (and U.S. 52) west to Rogers, Albertville and Monticello. I-694 east takes over along the belt line through southeast Maple Grove. Photo taken 04/22/07. Interstate 94 east quickly splits with Interstate 494 south (Exit 216) from Weaver Lake Road (CSAH 109). I-694 east begins and coincides with I-94 for eight miles through Brooklyn Park to Brooklyn Center. Photo taken 06/14/15. South through Plymouth and Minnetonka, Interstate 494 provides a bypass route of Minneapolis to I-35W at Bloomington. The route reconvenes with I-94 at Oakdale (Exit 249). Photo taken 04/23/07. Unweave the Weave, Minnesota Department of Transportation (MnDOT) project web site. I-694 North Central project, http://www.dot.state.mn.us/metro/projects/694expand/index.html Minnesota Department of Transportation (MnDOT) project web site.